The Rajasthan University of Veterinary & Animal Sciences has issued the official notification as per which, online applications are being invited for providing admissions to the candidates in B.V.Sc. & A.H. Degree Courses offered by the University. With the view to offer admissions to the candidates in Bachelors of Veterinary Science & Animal Husbandry (B.V.Sc. & A.H.) courses, the Rajasthan University conducts Rajasthan Pre Veterinary Test (RPVT) on 09th June 2019. This year also, the University has invited online application for RPVT-2019 from 15th March 2019 to 15th April 2019. Rajasthan RPVT Application Form 2019: As per the official notification, the Rajasthan University of Veterinary & Animal Sciences is going to conduct the RPVT Examination on 09th June 2019. In view of this, the University has invited online applications for Rajasthan Pre Veterinary Test (RPVT). The candidates can hereby check the required eligibility conditions which they need to possess in order to apply for RPVT-2019 Examination. The students can apply for the application form for admission from 15.03.2019 to 15.04.2019 and with late fee from 16.04.2019 to 22.04.2019 through the official website. The candidates should be more than 17 years of age and less than 25 years of age. The candidates must have completed 10+2 with Physics, Chemistry, Biology/Bio-technology and English subjects from a recognized University. Also, the candidates belonging to General category must have scored at least 50% marks in aggregate subjects of Physics, Chemistry, Biology/Bio-technology and English in Senior Secondary Examinations. However, in case of reserved category, the candidates must have scored 47.5% marks in their Senior Secondary Examinations. The candidates need to satisfy the above given conditions in order to apply for RPVT-2019 Examinations. 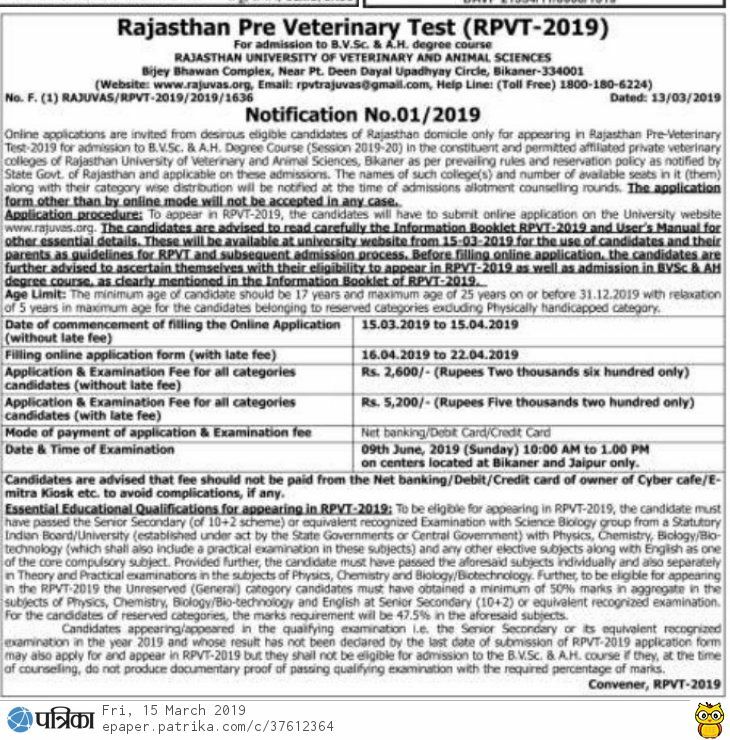 All the important dates, procedure to fill the online application forms along with the application fee regarding Rajasthan Pre Veterinary Test (RPVT) are being provided in the following paragraphs. The interested candidates can fill the online application forms through the official website of rajuvas.org. Visit the official portal and go to News & Updates section. There will be a link for RPVT-2019 Application Form. Click on the link and carefully fill all the mandatory information. The candidates will also have to provide scanned copy of some documents while filling up the application form. Lastly, the candidates will have to pay online application fee for the application form to be successfully submitted. The application fee (including the examination fee) is Rs.2000/- (without late fee charges) & Rs.4000/- (with late fee). All the candidates whose applications forms will be duly accepted by the Rajasthan University will be issued the admit cards for appearing in Rajasthan Pre Veterinary Test (RPVT) 2019. More information about RPVT Hall Tickets, selection procedure and the Counselling/Allotment of seats are being given in the following paragraphs. The candidates will attain their admit cards through the official web portal of Rajasthan University of Veterinary & Animal Sciences. It is expected that the Rajasthan University will be releasing the admit cards for RPVT-2019 two weeks before the commencement of examination. The RPVT 2019 Examination is going to be conducted on 09th June 2019 from 10 Am to 1 Pm. As per the official notification published by Rajasthan University of Veterinary & Animal Sciences, the candidates will be selected for admissions in B.V.Sc. & A.H. Degree Courses on the basis of marks in RPVT-2019. Based upon the marks obtained by the candidates in Rajasthan Pre Veterinary Test (RPVT), final merit list will be created by the University and candidates will be shortlisted. The shortlisted candidates will then be intimated for counselling rounds. The counselling will be conducted by Rajasthan University of Veterinary & Animal Sciences & the date, timings and venue will be provided at the official website of rajuvas.org. Under the counselling round, the shortlisted candidates will be called for verification of documents and allotment of seats in B.V.Sc. & A.H. Courses. The candidates will not be eligible to take admission if he/she fails to produce original documents during the counselling round.